After signing up for GOLD’S FIT®, Peggy Lindo dropped 75 pounds and is making the most of her retirement. In 2014, Peggy Lindo had just retired from her job as an administrator for a Veterans Affairs hospital. Though retirement meant more free time to do the things she enjoyed, she found it difficult to take walks with her husband or play with her grandson. Even brief periods of activity left her tired and out of breath. Shopping for clothes, something she once enjoyed, was frustrating and depressing. 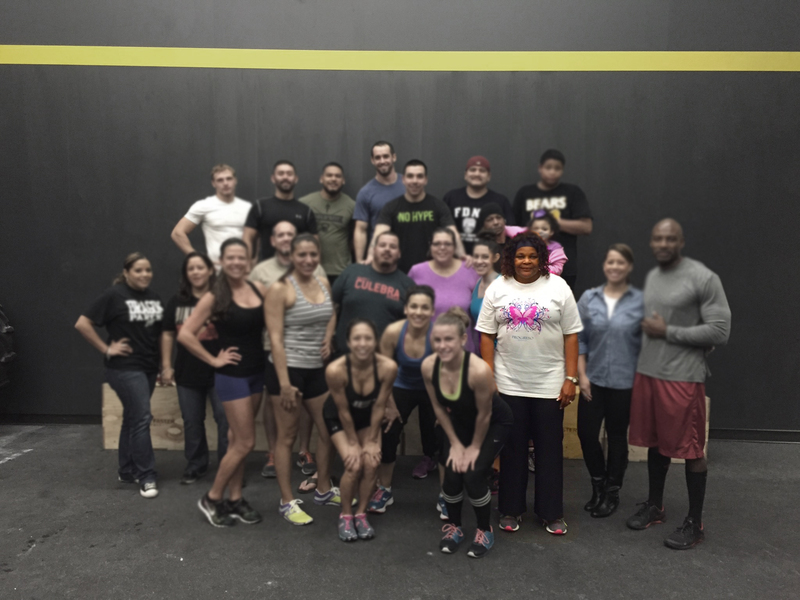 There was a Gold’s Gym about a mile from her home in San Antonio, so Peggy (pictured above in the front row, third from the right) decided to join. She hoped to gain mobility, lose weight and spark some new healthy habits. But when she first walked in she couldn’t help but feel overwhelmed. Soon after joining the gym, Peggy signed up for GOLD’S FIT®, a coach-led functional fitness program featuring individually adapted strength, endurance and resistance training in a supportive group environment. While her classmates lifted 30 pounds or more, she pumped away on 2-pound weights. At first, she could only jump rope 10 times. Leg raises were a struggle. Sit-ups and pull-ups were out of the question. There were times when Peggy went home crying, frustrated and ready to give up. But with the support of her coach and community, she always went back the next day. Christian Scogna, a GOLD’S FIT® coach, helped tailor the workout of the day to match Peggy’s abilities. With GOLD’S FIT®, every day is different, and every workout is adjustable. “Our daily workouts are designed for everyone and anyone, from athletes to people who have never touched a weight before,” Christian says. Christian and other Gold’s Gym coaches gave Peggy tips on how, gradually, to handle the heavier weights. That, in turn, gave Peggy more incentive and confidence to take on more. With Christian’s guidance, Peggy improved. She reduced her carb, sugar and fat intakes, and began eating more vegetables, fruit and fish. She maintained a schedule of attending GOLD’S FIT® five days a week. Like clockwork, she’d always be there for her early morning class, ready to sweat. The combination of coaching expertise and positive environment helped Peggy overcome any worries and created the atmosphere she needed to achieve her goals. When the group did a 400-meter run, Peggy was elated to hear her classmates calling out to her, shouting encouragement as she finished her sprint. They call her “Miss Peggy,” and she considers them her friends. Peggy, now 60, has dropped 75 pounds since she started at Gold’s Gym, and she plans to lose even more weight. She’s able to do squats, sit-ups, push-ups and pull-ups, and she has increased her jump-rope count from 10 to 150 repetitions. “My goal is to get to 200 reps,” she says. In the meantime, Peggy doesn’t have any trouble going for walks with her husband or keeping up with her 9-year-old grandson, who sometimes goes on runs with her. Shopping is fun again, too, Peggy says. She’s dropped three dress sizes and is able to buy clothes she couldn’t even try on three months ago. And when she buys something, she can’t wait to get home and try it on for her husband. Inspired by this story? Read more of our stories about individuals achieving their fitness goals at Gold’s Gym. Through the Gold’s Gym Challenge, a firefighter transformed his life to keep saving others. A mom’s best reward for getting in shape: teaching her boys about good health. 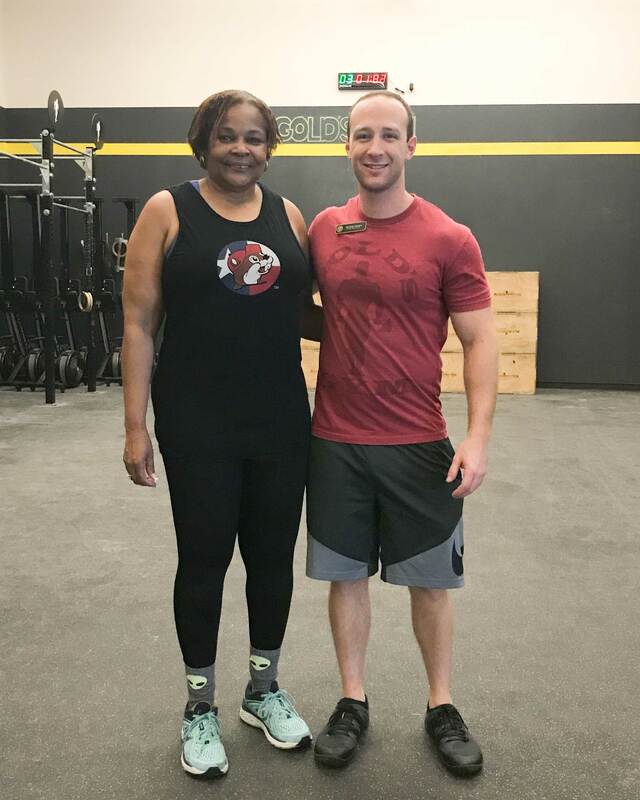 After relocating, she found a home at Gold’s Gym and created a new life.